If you’re in the mood for a crisp, bright salad, that’s still hearty enough to fill you up, then you’re in the right place. 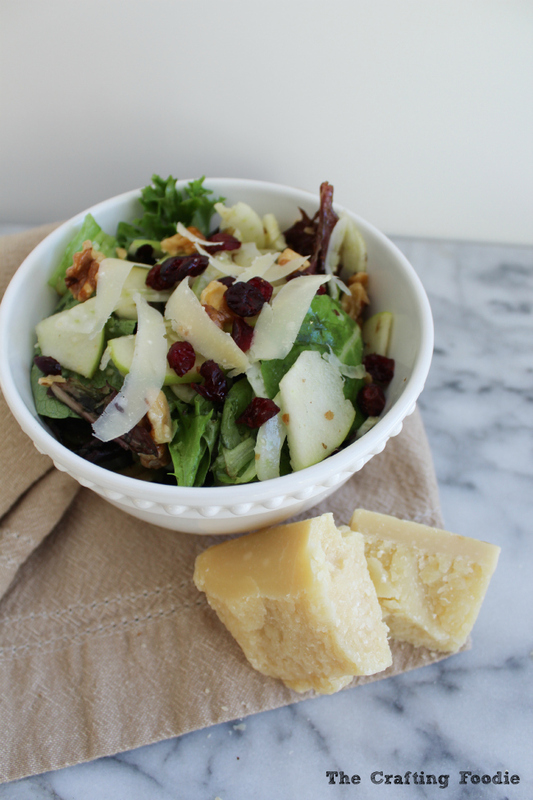 This Fennel and Green Apple Salad is made with shaved fennel, thinly sliced green apples, roasted walnuts, dried cranberries, and it’s topped with Parmigiano Reggiano cheese. The dressing is a simple lemon vinaigrette that bring out the brightness in the fennel and apples. Fennel is available all year, but it’s sweetest in the late fall until early spring. But, I have to be honest with you, I often crave this Fennel and Green Apple Salad in the summer. It’s so crisp and light with such a mild flavor, that it’s perfect at a barbecue or to take on a picnic. I’ve made this Fennel and Green Apple Salad in the winter and the summer, numerous times, and I have to say that the difference is subtle. I have yet to come across bitter, out-of-season fennel. Maybe I’ve just been lucky, but I’m still planning to make this delicious salad all summer long. Over the past few weeks I’ve been enjoying this Fennel and Green Apple Salad for dinner along with some grilled fish or chicken. It’s nice and filling without feeling heavy. Plus, because the fennel is so hearty, it holds up well even overnight. I would add the salad greens immediately before serving, but the fennel and apple can sit in the lemon vinaigrette for quite a while before wilting. While there are some great winter salads out there, I can’t wait for summer to be in full swing so that I can get my hands on some of my favorite salads with fresh corn, bell peppers, beets, zucchini, and eggplant! 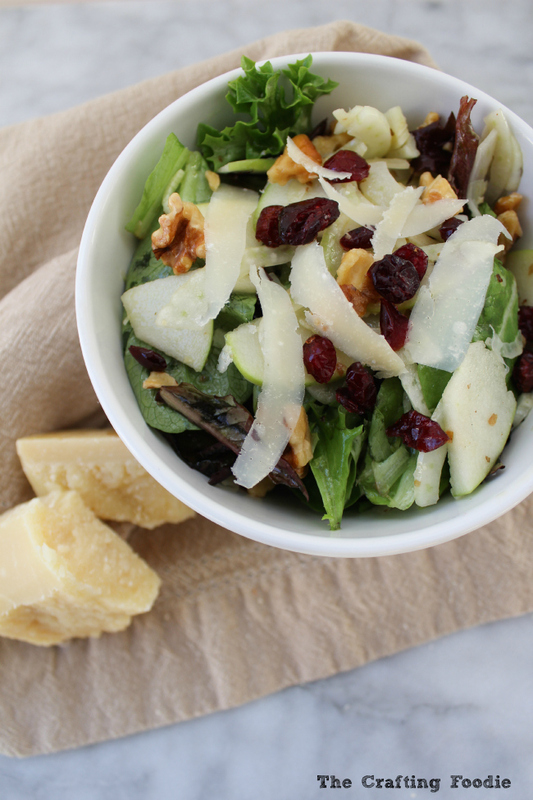 Shaved fennel and green apples pair beautifully with sweet dried cranberries, roasted walnuts, parmesan cheese, and a fresh lemon vinaigrette. Spread the walnuts over a baking sheet. Place in the preheated oven for about 10 minutes. Remove and allow them to cool completely. Slice off the tips of the fennel, leaving only the blub. Slice the fennel bulb vertically to expose the core of the blub. Remove and discard the core. Placing each half of the fennel blub on its flat side, thinly slice the fennel. If you have a mandolin, you can shave the bulb into paper thin slices. Half and core the green apple. Cut into thin slices. 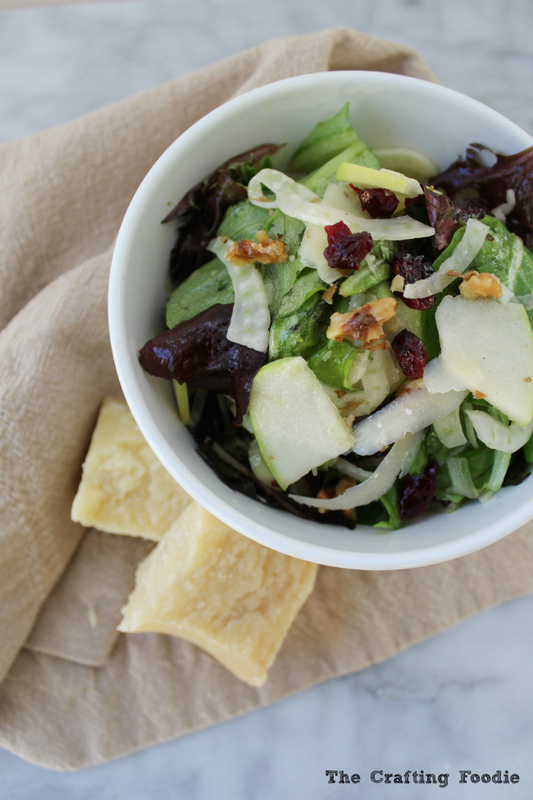 Place the fennel and apple in a large bowl along with the salad greens, salt, pepper, cranberries, and lemon zest. Toss to combine. Chop the roasted walnuts. Add to the salad. Drizzle the lemon juice and olive oil over the salad. Toss to combine. Using an peeler, shave pieces of Parmesan cheese to top the salad. Aida, can you believe I’ve never used fennel before? I’ve always wondered how to use it. (Now I know!) Excited to try this salad and the lemon vinaigrette sounds yummy. Thanks for this great springy recipe ! Oh what a lovely salad!! The fennel and apple combo is just amazing! Fennel salad that’s a new one. My greedy curiosity is on overload. A must try. Lovely and wonderful flavors! Great recipe. What a great salad combo!